There he goes again! Fresh off the deregulation of builder’s codes and requirements across the board, and after launching a proposal to gut county employees with a ham handed privatization scheme, our good old boy “Bulldozer” Blaine Young has released his latest diatribe aimed at the heart of Bay cleanup plans from the state. 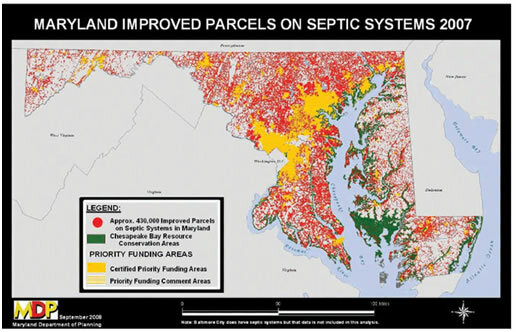 “Maryland has about 430,000 septic systems on developed parcels; 420,000 of them are on residential parcels. About 50,000 are located in the Critical Area, sensitive areas within 1,000 feet of tidal waters. Here’s an overview of Blaine Young’s Tentacle column Here. It contains two boogey men, state planning personified by Governor O’Malley, and Democrats, whose little lefty hearts only beat in rhythm to sissy little feel good causes – not the manly Bob the Builder type’s interests! Strike One! – sorry Blaine, but allowing up to 5 septic lots per farm is not really eliminating property rights, it’s really only stopping the kind of massive developments sought through rezoning by the builder boys. Strike Two! – sorry Mr. Blame, but Democrats believe in their children’s futures too, and thinking a bit farther out than suburban sprawl as the highest achievement of human happiness. Strike Three! – sorry Bad Boy Blaine, but you’ve objected to a proposal based on hearsay and illogical thinking rather than addressing the basic facts and rationale – where do you address the actual concept of limiting septic growth? Do you think that if we were living back in the 1950’s Mr. Blaine would be fighting for outhouses in the City? Excuse me for a cigarette break, and a martini at lunch, and a call to make sure my wife's home doing my laundry! 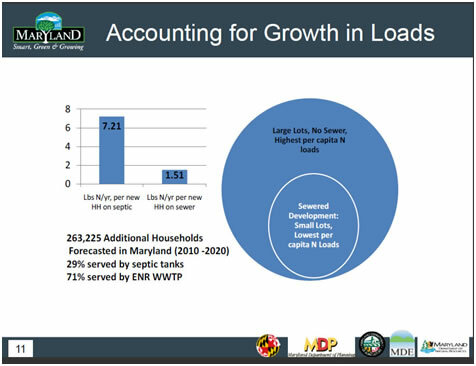 “An estimated 7 percent (3.6 million pounds per year) of the Chesapeake Bay's total nitrogen load in Maryland comes from septic systems. Based on current growth trends, MDP projects about 145,000 new septic systems will be added over the next 20 years, resulting in a 34-percent increase in total nitrogen load. So who’s going to benefit? #1 Blaine Young, with campaign cash and a Builder Boy campaign for County Executive! #2 Bob the Builder’s, they can put away the dry mock crying towels and pave a few parking lots and bulldozer more large developments! So who’s going to lose? #1 Farmers, who stand the watch creeping growth and rising land development values eat away at their passion to keep farming. #2 Ordinary citizens stuck in increasing traffic to drop their children at overcrowded schools. #3 The wallets of future residents who will someday have to mitigate the problems of privatizing increased growth profits and passing along responsibility and costs. Watch out when the big bulldozer comes through, it’ll run you over and never stop!